Visiting the National Archives in Washington, D.C. The National Archives and Records Administration stores and provides public access to the original documents that set up the American government as a democracy in 1774. Visit the National Archives in Washington, D.C. and you will have the opportunity to get up close and view the United States Government's Charters of Freedom, the U. S. Constitution, the Bill of Rights, and the Declaration of Independence. You will discover how these historical documents reflect our nation's history and values. The records of the nation's civil, military and diplomatic activities are also held by the National Archives for present and future generations. Historic artifacts include items such as President Ronald Reagan's speech card from remarks made in Berlin, Germany in 1987, photographs of 19th-century child labor conditions, and the arrest warrant for Lee Harvey Oswald. The National Archives Building in Washington, D.C. is open to the public and offers many programs that are educational and entertaining. Films, workshops, and lectures are presented for adults and children. The National Archives and Records Administration is located at 700 Pennsylvania Avenue, NW. Washington, D.C., between 7th and 9th Streets. The Research Center entrance is on Pennsylvania Avenue and the Exhibit entrance is on Constitution Avenue. The closest metro station is Archives/Navy Memorial. Admission is free. The number of people admitted at one time is limited. To make an advance reservation and avoid a long wait in line. 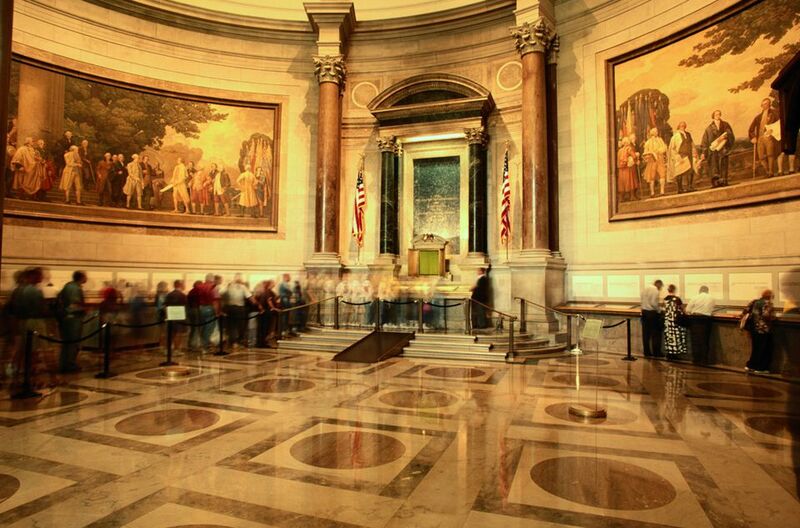 Charters of Freedom - the Declaration of Independence, the Constitution and the Bill of Rights in the National Archives Rotunda are the centerpiece of the National Archives Experience. Public Vaults - the permanent exhibition creates the feeling of going into the stacks and vaults of the National Archives. The interactive experiences of the vaults draw their themes from the Preamble to the Constitution. William G. McGowan Theater - the 290-seat theater uses state-of-the-art technology to present a dramatic film illustrating the relationship of records and democracy through the lives of real people. The McGowan Theater also serves as a venue for documentary films. Special Exhibition Gallery - devoted to document-based exhibits on newsworthy and timely topics and traveling exhibits from Presidential Libraries and other sources. Exhibits that open in the Gallery travel to other venues in the U.S. and abroad. Learning Center - engages America's youth, parents and teaching professionals. The National Archives is a national resource, consisting of the main building in downtown Washington, DC, National Archives at College Park, Maryland, 12 Presidential libraries, 22 regional records facilities located around the country as well as the Office of the Federal Register, the National Historical Publications and Records Commission (NHPRC), and the Information Security Oversight Office (ISOO).